The International Journal of Education and Psychology in the Community (IJEPC; ISSN: 2069-4695) is a peer reviewed journal that publishes original empirical and theoretical studies and analyses in education and psychology which aim to integrate the major factors that relate the individual and the environment, within and across complex social communities. The editors seek to publish articles with emphasis on empirical studies across a wide range of methodological paradigms including experimental, educational, clinical, criminological, industrial, and social psychology. 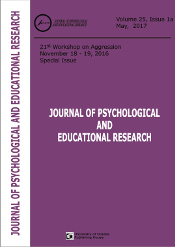 The journal invites also theoretical manuscripts that make a clear and significant contribution in education or psychology, that address the conceptual, methodological, and practical challenges and major determinants of individual in the social context, person-environment interactions, and analysis of the broader contextual factors.